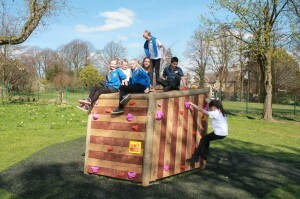 Our new playground boulder provides a great range of climbing challenges for the primary and infant age range. All with our range of safety surfaces to suit either tarmac playgrounds, grassy areas or other ground spaces. The new playground boulder is hard wearing and extremely versatile. Re-arrange the climbs whenever you want to create new climbing challenges – easy or hard! Our rubber crumb safety surfacing makes for a soft landing and also provides a neat, clean area for the activity. This boulder is designed for Children from 4 to 10 years old. The climbing routes are set to suit your age and ability range. Kids can climb up onto the top, and simply slide down the slide to the bottom. Or they can work their way round one of the traverse routes on the sides of the boulder.